Allow Ramzy and Antony to work with you to plan your formal wear for any formal event or wedding. We have the ability and expertise to offer illuminating recommendations. We offer complete custom services for unique formal wear, suits and shirts as well as a selection of made to measure items that will help you coordinate your wedding party. Bring your tuxedo suit or dress suit to us and allow our tailors to custom fit each of your attendants so that every picture delivers a look of style and refinement. We hope this experience will be as exciting and fun as it was intended to be. Black tie attire recommends that you wear a tuxedo, do not wear a black suit. A Gariani classic tuxedo or Made to Measure tuxedo will always leave you feeling confidently dressed. Wear a black tuxedo jacket, tuxedo pants, formal dress shirt, cummerbund or vest, bow tie and highly polished dress shoes. If your existing tuxedo needs custom fit alterations, we will be happy to offer you a fitting and a full evaluation of your garments. The first rule in dressing for an event is to understand the invitation. Determine the importance of appropriate dress through the invitation itself. There will come a time when every man will need to wear a tuxedo. The tuxedo is the consummate men’s attire, the most formal of our custom suits. This is an opportunity to take our finest fabrics and trim them with the purest silk and satin details. Woven cashmere and silk luxury fabrics have paved the way to a more modern approach to formal wear. Choose from among the most elegant styles and subtle nuances. Always err on the side of being a bit overdressed. As we’ve said, it’s very easy to take off a necktie or shed a jacket and become less formal. Don’t let the diminutive phrasing fool you — semi-formal attire is still the strictest dress code most of us will wear in our lives. When it comes to the second wedding or the formal occasion that goes beyond standard. Gariani Menswear understands that not everyone is going to conform to 19th century dress codes. A more contemporary ‘formal with a twist’ option tends to suit the faster paced, fashion conscious man. We offer a wide variety of extraordinary fabrics for that formal jacket that is meant to be worn to the themed event with flair. When it comes to the groom, too often they are overshadowed by the bride. After all, it is her day. But, have no fear, Gariani has you covered for your wedding day. Whether it is just the groom, a small wedding or an entire wedding party, we specialize in coordinating all of the details to synchronize chosen styles, colors and designs. If you prefer matching tuxedos with your entourage or a monogrammed suit especially for you, we can make sure your wedding day is truly one to remember. A black bow tie and a simple white pocket square can be all you need to compliment your custom tuxedo. However, Gariani Menswear offers a wide variety of different accessory collections. We feature handmade bow ties and pocket squares, made of the finest silks cottons and linens. Our formal ties and cummerbunds are offered in a variety of classic silks and textured jacquards in a wide range of solids, prints and woven's. Our cufflinks and studs are also hand-crafted fine jewelry. 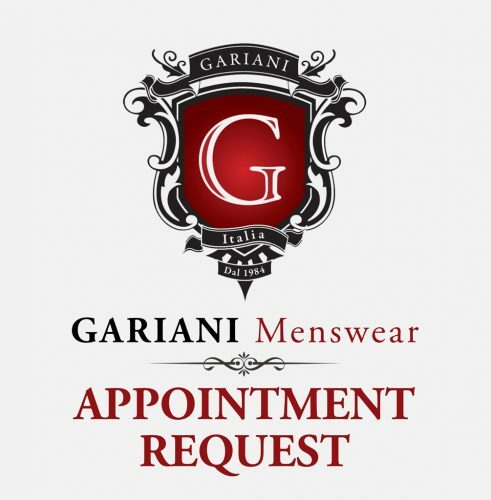 If you would like formal wear consultation with Antony or Ramzy at Gariani Menswear in North Dallas, please phone 972-661-0104 or contact us for a private consult.